Betsey Nohe, vice president of supply chain for Morton Salt, was a featured speaker at the 2017 Chicago Supply Chain and Sustainability Summit. Supply chain professionals from 70 Chicagoland organizations attended the 6th annual Chicago Supply Chain and Sustainability Summit on October 16, 2017. 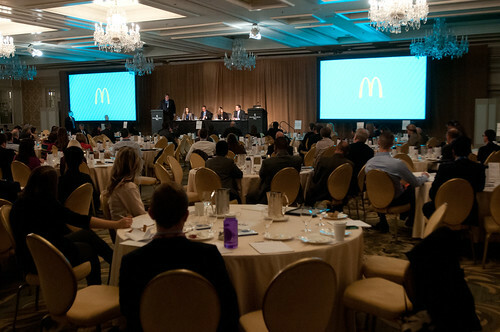 Held at the Four Seasons Hotel in Chicago, the summit featured industry leaders from organizations including McDonald's, Morton Salt, the U.S. Department of State, and Massachusetts Institute of Technology discussing supply chain operations, sustainability, social enterprise, economic development, and other critical issues in supply chain management. The Supply and Value Chain Center recognized the summit’s three featured speakers by creating $1,500 student scholarships in each of their names. Kevin got our day started with a terrific overview of the opportunities and challenges that the United States faces with Brazil and the “Southern Cone,” which encompasses Argentina, Chile, Paraguay, and Uruguay. Kevin deftly put these into context, noting the potential impact on global supply chains. Jim presented a particularly engaging discussion about supply chain innovation — what it is, what it isn’t, and the keys to successfully initiating and implementing innovation. Among the key takeaways were that successful supply chain innovators experiment a lot (“fail fast”) and collaborate up and downstream. Betsey wrapped up the presentations with a very candid and informative session on the transformation of Supply Chain at Morton Salt. She took us through their journey, from creation of the supply chain function to network restructuring, and technology implementation. She also discussed Morton’s efforts to help people through the transition, illustrating how training and encouragement enabled people to assume new roles in the organization. The Loyola Business Leadership Hub awarded $2,000 scholarships to two Loyola University Chicago students who plan to contribute to sustainability and supply chain improvements through their career. The scholarships are supported by the Dan Brutto Scholarship Fund. Susana is in the master of science supply chain management program. She is a board member of the Quinlan Graduate International Club, as well as a member of the Quinlan Business Graduate Association and APICS Loyola Chapter. Tessa is an undergraduate business student majoring in information systems and sports management and minoring in marketing. She is particularly interested in the use of data analytics to make better business decisions. In addition, she has an interest in using the ethical and social justice perspectives that she has gained at Loyola in her future career.